This was not the best of weeks for the cannabis industry, with a few deals falling through the cracks and a couple execs leaving their companies. Aphria Inc (NYSE: APHA) tumbled Wednesday after rejecting Green Growth Brands Inc (OTC: GGBXF)'s hostile takeover bid. On the other hand, Argentina’s government authorized the country’s first medical cannabis grow operation, half owned by Aphria, in a move that bodes well for the company and other players with investments in Latin America. In other Latin American news, we learned that Colombia is set to begin exporting cannabis to Canada, following the granting of an export permit to Clever Leaves. “We've seen several relationships within the cannabis industry blow up over the past two weeks. Between Namaste Technologies’ termination of its CEO, the lawsuit from MedMen's CFO and then FDS Pharma and Auxly ending their agreement — it's been a bad week for the industry," Green Market Report CEO Debra Borchardt told Benzinga. With the earnings season just around the corner, check out this story on what to expect from the main companies in the space by Benzinga’s Alex Oleinic. Over the last five trading days, the United States Marijuana Index, which tracks most of the largest marijuana stocks in the U.S., lost roughly 6.6 percent, while the North American Marijuana Index, which also includes Canadian stocks, lost approximately 8.3 percent. Over the same period, the Horizons Marijuana Life Sciences Index ETF (OTC: HMLSF) (TSE:HMMJ) dropped 3.6 percent, while the ETFMG Alternative Harvest ETF (NYSE: MJ) lost roughly 4.35 percent. The SPDR S&P 500 ETF Trust (NYSE: SPY) closed the period down about 0.2 percent. Following the controversy around CBS Corporation (NYSE: CBS)’s rejection of a pro-cannabis legalization TV ad that Acreage Holdings intended to run during the Super Bowl, Forbes reported a marijuana-related ad did air during the grand football event. The caveat: the ad was aired on CBS TV 2 Virgin Islands, a CBS affiliate in the U.S. Virgin Islands owned by Innovative Communications Corporation — and not the NYSE-traded media behemoth. Last year, Benzinga reported on this same ad, from 420MEDIA, being aired during primetime programming on BRAVO, Discovery and the History Channel in the greater Los Angeles market. The spot in question featurs Senator Positive T.A. Nelson, a seven-term senator from the island of St. Croix, discussing the science and economic power of medical cannabis. See his reaction as the ad aired during the Super Bowl below. Helix TCS Inc (OTC: HLIX) completed the acquisition of Amercanex International Exchange, one of the first cannabis electronic trading platforms in the legal cannabis industry. Building on its recent merger with BioTrackTHC in 2018 and Cannabase in 2016, the acquisition further expands Helix TCS’ Critical Infrastructure Services Platform. This platform enables new and already operating cannabis businesses, as well as ancillaries and governments, to manage mission critical infrastructure in their supply chain, inventory and compliance functions. “Due to the unique compliance requirements in each regulated cannabis market, providing a compliant exchange marketplace is an extremely complex endeavor. The acquisition of Amercanex will let us deepen the unique suite of technology to enable real-time access to wholesale marketplaces on a global scale and to facilitate transactions between licensees in completely different regulatory environments in a compliant manner,” Helix TCS Executive Chairman and CEO Zachary Venegas told Benzinga. Green Thumb Industries announced it has signed a definitive agreement to acquire For Success Holding Company, creator of the Los Angeles-based Beboe brand of cannabis products. Beboe products will expand beyond California and Colorado with distribution in select GTI markets. iAnthus Capital announced the closing of its acquisition of MPX Bioceutical, creating a combined company valued at CA$1.6 billion ($1.2 billion). The new entity becomes one of the world’s largest cannabis companies, operating in 11 U.S. states with a population of over 120 million people — and licenses to operate up to 63 dispensaries and 600,000 square feet of cultivation space. “2019 will be a transformative year for iAnthus, with the closing of our business combination with MPX being a crucial step forward. As the U.S. cannabis market continues to expand with increasing consumer and regulatory acceptance, iAnthus will continue to execute and provide the quality products and brands that our customers demand. As demonstrated with our 2018 acquisitions in Florida and New York, and now with the closing of our MPX transaction, the iAnthus team continues to demonstrate its focus on growing its platform and operations,” said iAnthus CEO Hadley Ford. Dixie Brands announced a strategic move into Michigan, which is one of the nation’s largest medical markets with 300,000 consumers and counting. As Michigan transitions into a legal, adult recreational market, consumers in the state will have access to Dixie Brand’s portfolio of more than 100 diverse products across 15 different categories, including edibles, tinctures, topicals and connoisseur-grade extractions. This news comes on the heels of last week’s deal with Khiron Life Sciences to expand Dixie’s footprint into Latin America. “Michigan is the first of several new U.S. states that Dixie will enter in 2019 as we execute our strategic North American expansion plan," said Chuck Smith, CEO and co-founder of Dixie Brands. "Through our partnership with Choice Labs, the state’s first vertically integrated cannabis producer, Dixie will introduce its full portfolio of cannabis-infused products throughout the state beginning in March 2019." Green Horizon had its official groundbreaking at the future home of Coachella Cann Park, a multipark facility for indoor cannabis cultivation, manufacturing and distribution. Green Horizon is a vertically integrated cannabis bioscience and holding company that's developing 472,000 square feet of indoor cultivation, light deprivation greenhouse, manufacturing and distribution capabilities in Coachella, California. Founded in 2016 by Michael Meade and Los Arias, Green Horizon will provide white labeling services for brands at scale, in addition to creating its own brands utilizing proprietary genetics. “We are thrilled to begin developing this venture and are looking forward to leading the way in cannabis cultivation,” Meade told Benzinga. Sonoma, California-based QVI announced it’s refitting an approved 8,300-square-foot facility in Santa Rosa with dedicated space for a large-scale commercial kitchen to produce baked goods, chocolate products and a hard candy and gummy line. QVI’s goal is to become a premier contract manufacturer in California, the largest single market in North America. “The Galley plans to add to the Sonoma County experience by crafting exceptional cannabis products, as well as host cannabis tours and educational events — 'California Dreamin’' at it’s finest,” said co-founder Annie Holman. In a partnership with the Kolas Group, Aster Farms’ pesticide-free cannabis is now available throughout Sacramento. “Kolas is revolutionizing the cannabis retail experience and we are very excited to be a part of education and provisions in Sacramento,” said Aster Farms President Sam Ludwig. Canopy Rivers Inc (OTC: CNPOF), the investment platform of Canopy Growth Corp., announced the completion of a $1- million financing in Canapar Corp, the Canadian parent corporation of Canapar SrL. Italy-based Canapar SrL is a manufacturer and processor of CBD oil and isolates and is playing an important role in meeting the increasing demands of the European CBD and hemp markets. The company is also developing and commercializing CBD-infused cosmetics, skincare and beauty products for the Italian cosmetics market — the fourth-largest such market in Europe — and for the global market, which covets “made in Italy” brands. “The Italian and European cannabis market landscape is undergoing dramatic change, and European demand for CBD has exploded based on the growing belief of CBD’s positive health effects. This investment allows Canopy Rivers through Canapar to capitalize on this untapped opportunity and penetrate one of the five largest cannabis markets in Europe,” said Canopy Rivers President Narbe Alexandrian. Young America Capital, a licensed investment bank and broker-dealer, announced the successful brokerage of the assets of Green Meadows Wellness (dba Infinite Wellness Center), a vertically integrated cannabis company in Colorado. The company was purchased by LivWell Enlightened Health. “We have an extensive network of investors in the cannabis industry which provides our clients with a number of options,” said Peter Formanek, the head of Young America Capital. The legendary Willie Nelson and his family are debuting their take on better health and wellness through hemp with the official launch of the brand Willie’s Remedy and its first product: infused whole-bean coffee. The coffee is infused with certified organic, full-spectrum hemp oil grown in Colorado and is sourced from various smallholder farms in Colombia’s Santuario region. The music icon and longtime U.S. farming activist leads the charge for putting American-grown hemp to good use with Willie’s Remedy, which will feature a range of non-intoxicating, hemp-based products designed for health-conscious consumers of all ages. Nelson and his wife Annie made headlines in 2015 when they introduced the cannabis brand Willie’s Reserve, which taps a carefully selected network of state-licensed cultivators to provide the main ingredient for products sold in legal medical or adult-use cannabis markets. Wana Brands products are now available in Illinois, just as the state kicks off the new Opioid Alternative Pilot Program, allowing patients suffering from conditions that require an opioid prescription to purchase cannabis. Wana Brands’ medical cannabis products are available in Illinois dispensaries through an exclusive licensing agreement with Grassroots Cannabis, the state's largest medical cannabis company. “Illinois is a pivotal piece of Wana’s expansion strategy. Wana has successfully expanded through the West, and now with states including Illinois and Michigan the Midwest. We commend Illinois’ Opioid Alternative Pilot Program, which provides patients suffering from debilitating medical conditions with a safe alternative to deadly opioids," said Nancy Whiteman, founder and CEO of Wana Brands. 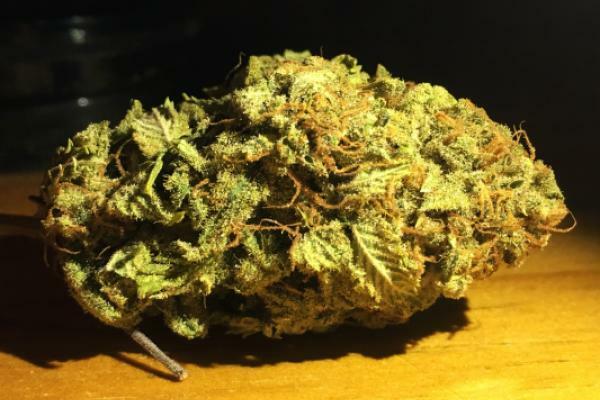 Wana is known for product consistency, which is crucial for medical marijuana patients who depend on that reliability." Canadian cannabis producer Aurora Cannabis announced that Health Canada granted its extraction technology partner Radient Technologies Inc (OTC: RDDTF) a standard processing license. More about this story here. Canadian cannabis producer The Flowr Corporation (OTC: FLWPF) submitted an application to list on the NASDAQ. Read Andrew Ward’s story here. Read about these and other news on LB Equity, Verano Holdings and The Supreme Cannabis Company with our friends at Marijuana Money. Morning Brew, a free daily newsletter designed for young business professionals, released a data survey showing how business and finance professionals view cannabis, both from a legalization standpoint and as an investment opportunity. In response to achieving a milestone of 1 million subscribers for their newsletter, Morning Brew put out a survey to their subscriber base, collecting key data and insights on the composition of its readers as well as their lifestyle, habits and beliefs. The findings, particularly those around cannabis, were revealing, showing that 81 percent of Morning Brew subscribers support the legalization of marijuana. The Morning Brew newsletter is primarily read by the modern business leader and HENRYs (High Earners, Not Rich Yet). Among this audience, nearly 70 percent said they would actively consider investing in a cannabis stock as part of their portfolio. According to Austin Rief, co-founder and COO of Morning Brew, 80 percent of their readers invest in the stock market, while 41 percent of their readers older than 24 make more than $104,000 a year. Due to the rapid growth of the cannabis industry and huge M&A and IPO deals that have recently occurred, young investors will be hard-pressed to ignore the opportunity the cannabis industry presents, Rief said. 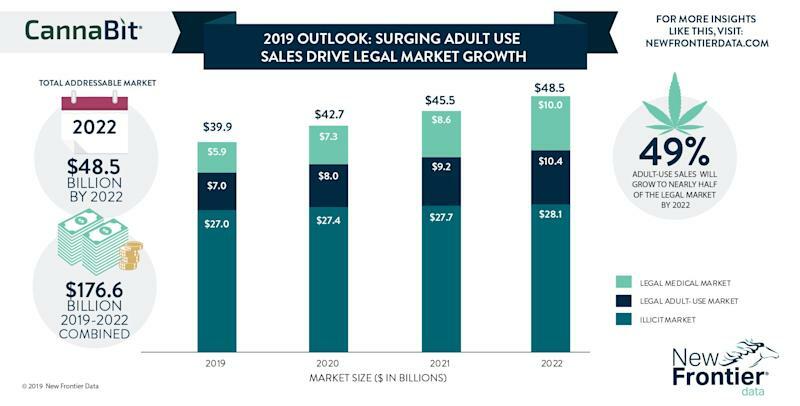 Also check out this interesting infographic from New Frontier Data on the surge of adult-use cannabis sales. GrowGeneration Corp (OTC: GRWG) acquired certain assets of BWGS, LLC. 420 Investor Alan Brochstein weighed in on GW Pharmaceuticals and short-term volatility. Cannabiniers announced the launch of a line of non-alcoholic cannabinoid-infused craft beer in California. GMP analyst Martin Landry downgraded Cronos from Buy to Hold and reiterated his CA$24 price target (about $18 in U.S. dollars) for the stock. Oleinic also reported on Canopy Growth’s plan to expand its hemp investment in the U.S. to $500 million. Tyler Beuerlein of fintech company Hypur explained “Cannabis Industry Banking And Tax Issues” in a cool video produced by our friends at Green Flower. ETFMG Alternative Harvest ETF hit the $1-billion mark. And Green Growth Brands said it will be working with Authentic Brands Group and Tilray to develop a line of CBD-infused personal care products. Feb. 12-13: CannaTech brings some the world’s highest-caliber players in cannabis to an event focused on medicinal marijuana and the opportunity within. “This is a golden opportunity to network with the bigger players already maneuvering in the Central and South American region,” the organizers said. But, why Panama? “The cannabis industry in Latin America is projected to reach $12 billion within the next 10 years, as medical cannabis begins to legalize across the region and regulations shift, worldwide. Due to its geographical placement, tax regulations and longstanding position as a major throughway for international trade, Panama has the potential to be the center of the Latin American cannabis industry." Feb. 12-13: The National Cannabis Industry Association brings together people, labs and product manufacturers who are innovators in the industry for the Seed to Sale Show, along with advocates and issue experts. Business-to-business networking, cultivation, extraction technology and manufacturing are all highlighted at this event. The Seed to Sale Show focuses on technology and science as it pertains to the seed-to-sale cycle, separating it from the run-of-the-mill cannabis trade shows. The trade show brings more than 150 exhibitors and two days of rigorous educational content featuring more than 75 speakers from across the cannabis space. Feb. 19: Grit Capital and KCSA are hosting an Unforgettable Cannabis Tour in Florida. The Florida Cannabis market is on track to be larger than the Colorado and the entire Canadian market with medicinal cannabis only, they said. That's why Grit Capital & KCSA are hosting a unique investor tour of the Florida cannabis market highlighting iAnthus Capital, Curaleaf and Liberty Health Sciences. This tour is an opportunity for institutional portfolio managers, investment advisors and family offices to visit dispensaries opened by some of the top U.S. cannabis multistate operators, participate in personal discussions with executive management and gain insight on the rapidly growing U.S. cannabis landscape. "We can't wait to show Florida an exclusive event done by Grit Capital & KCSA! All three highlighted companies have something unique to offer — our job is to create face-to-face engagement to spark a real relationship between interested investors and the companies," said Grit Capital CEO Nicole Marchand. "Our goal is to create the highest ROI for both sides, and what could be better than doing it in the Sunshine State?" Feb. 23: Chanda Macias, MBA, PhD, founder of National Holistic Healing Center, and chairwoman and acting CEO of Women Grow, will be the keynote speaker at a free daylong conference aiming to help New Yorkers of color to join the ranks of those who own legal cannabis and hemp businesses. Elected officials including New York State Attorney General Tish James will join medical clinicians, grassroots community and health organizers, attorneys and cannabis/hemp entrepreneurs who are among the lineup of national, regional and local expert speakers and workshop facilitators for The Business of Cannabis at Emmanuel Baptist Church in Brooklyn. Tickets are free. Feb. 27-March 1: The 5th Annual Emerald Conference will be held at Loews Coronado Bay Resort in San Diego. The conference brings together top scientists, extraction and cultivation professionals and visionary business leaders in a collaborative environment that fosters groundbreaking advancements. Feb. 27: CannaImpact and Nextage Innovation announce their first annual Cannabis Tech Pitch Night in Tel Aviv, Israel. The purpose of this itch night is to ignite innovation in the medical cannabis and tech industry and to provide pioneering startups with exposure to technology leaders, investors and potential partners, the organizers said. The winning startup will receive a complementary creative package to help push their venture forward, as well as mentoring from cannabis industry leaders. May 28-June 1: The Cons is a gathering of three trade and fan shows under one roof: the Cam Con, the Cannabis Con and the Inked Con. The Cons 2019, held at the SLS South Beach Hotel in Miami Beach, will offer a variety of seminars with top industry panelists, networking parties and performance displays to benefit the industry’s content providers, models and affiliates. While these industries have differences, in many ways they overlap. All three shows are model-driven because they are the true industry ambassadors, which is the core value of The Cons.